The other day I reached deep into the bottom drawer of my desk and emerged—not with what I was looking for—but rather a handful of badges. There, encased in plastic, were earlier versions of myself dating back more than 25 years to residency. 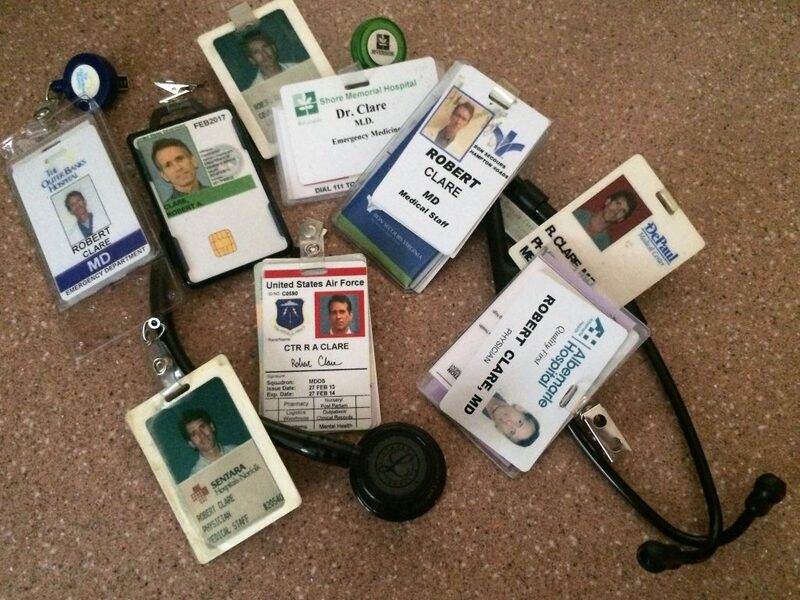 Since then I’ve worked in a lot of hospitals, met a lot of doctors and nurses, and treated nearly 100,000 patients. There’s no denying that I’ve aged. My face has grown thinner—almost to the point of gauntness. My hairline has receded, and there is more than a sprinkling of salt and pepper in what remains. The creases are deeper, the weariness more evident. But I’ve earned these outward changes, and they are mine. I’ll not erase them through some trickery of Botox or the taint of cold hard steel. Grouped together, the nametags got me thinking that the faces staring back at me represent more than just images of a more youthful me. Today’s badges come embedded with access codes. They open doors; doors to the hospital, the ER, the OR, and the ICU. They lift gates to the parking garage, and provide entry to the sanctuary of the physician lounge. But even more than photos and codes, these badges are totems; sacred emblems identifying me as a member of a unique and specific clan. Mine is the last group in healthcare willing to see anybody, for any problem, at any time. Uninsured or insured; black, white, or brown; gay, straight, or trans; old, young, or in-between; Jewish, Muslim, or atheist; sober, intoxicated, or high—in the end, none of it matters. The only thing that counts is that you have come to us for help. Things go wrong. There are gaps in knowledge, gaps in skill, but most often when mistakes happen, they occur due to gaps in attention—when we lose that essential sense of presence. When our head is buried in the computer—charting, charting, charting. When the next mandated interruption distracts us from the task at hand. When the gentle laying on of hands is replaced by the cold impersonal beam of the CT scanner. Never judge, always be professional—these are the dictums. It is easier said than done. We are challenged every day, and the Serenity Prayer is a constant reminder of our limitations. Despite the changes in my countenance so apparent when these badges are examined chronologically, some things haven’t change. Like the mission of emergency medicine to administer competent, compassionate, and timely care to those presenting with threats to life or limb. Same as it ever was. These badges are a reminder of the road I’ve traveled, a testament to the suffering I’ve witnessed, and emblems of my clan. To the nurses who saved me from myself so many times along the journey, and in so doing helped save the very patients that we are there to serve, many thanks. You know who you are. The abyss is deep and dark and, if not for you, I would have fallen long ago. To the patients I’ve helped, it’s all in a day’s work. And to those I’ve harmed, I’m sorry I didn’t serve you better. Nothing is forgotten. It’s all there in the badges. ← Update on low back pain. Great article Bob. This is wonderfully written and inspiring to read. This is really an awesome blog and it makes me feel a little nostalgic!! I must say that I truly do enjoy working with you. You and I seem destined to work the PIT assignment for the rest of our days at the hospital! Needless to say I enjoy the ups and downs as well as the highs and lows. The busy days as well as the more relaxed days. I have learned a lot from you, my friend! So keep up the good work!